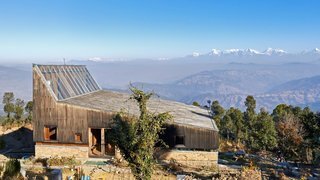 In a landscape dominated by the Himalayan mountain range, the sensible architectural approach is a minimalist one. 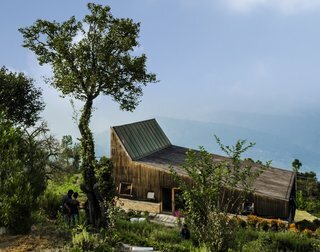 So, when Lokesh and his family fell in love with the sleepy Himalayan village of Satoli in northern India, they dreamed of a holiday home that would sit lightly on the land and blend into its scenic surroundings. 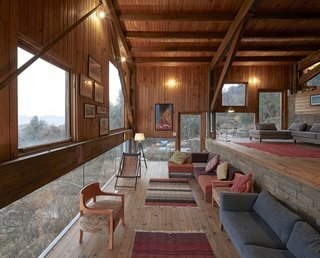 Teaming up with New Dehli–based Matra Architects, the family embarked on a five-year process to bring their dream home to life—no easy feat given the remote, rural location at 6,500 feet above sea level. 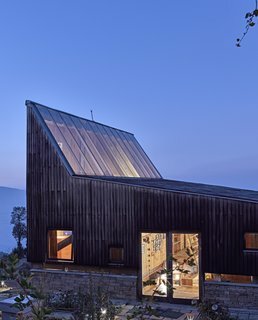 The peaked roofline mimics the mountains beyond. Careful studies of the traditional village houses and the community’s Spartan farming lifestyle inspired the design of the minimalist timber retreat—officially dubbed the Wood House—that steps down a three-acre terraced landscape. To minimize the home’s visual impact, the architects placed the 2,550-square-foot building on the lowest terrace. 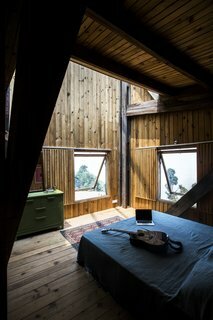 A sloped, double-glazed skylight floods the interior with natural light and provides stargazing opportunities at night. 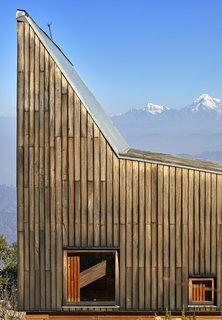 Much of the exterior is clad in vertical planks of locally sourced oiled Indian mahogany. A continuous band of glazing separates the timber cladding from a dry stonewall base, built of materials excavated on site. The band of glazing separates the timber cladding from the stone base. 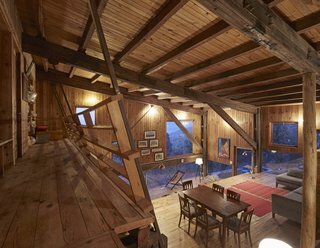 The timber-clad roof is supported atop four exposed truss frames built from glued sal wood planks fastened with steel tie rods. The truss frames span nearly 50 feet to provide an open interior space uninterrupted by intermediate columns. The entire home is supported by the robust truss frames. Inside, pine-paneled rooms step down in three levels, each roughly 560 square feet in size to match the existing terraced terrain. The upper floor houses the main entrance as well as the kitchen and two bedrooms. 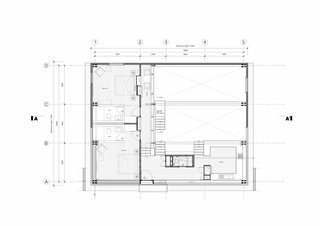 The lower level comprises a mezzanine dining area that descends into a spacious living room and two additional bedrooms. Level changes delineate programming in the interior without the need for walls, which would otherwise block natural light and views. 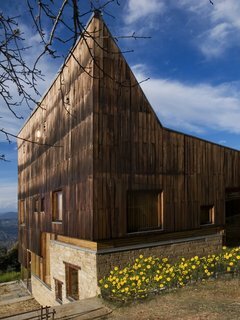 "Building this house has not been easy, especially with this kind of wood and glass facade," says Lokesh. "As you can imagine, transporting everything—including big sheets of glass onto the hills—has been hard. After five years of patience, labor, and resilience, we continue to furnish and fix the dwelling on an ongoing basis." The living room overlooks the landscape through a low horizontal band of glass. 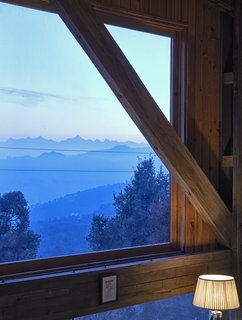 Their effort has paid off in spades—the Wood House has been positioned perfectly for breathtaking views of the snow-capped Himalayans during the day, while the twinkling lights of Almora town and stars can be enjoyed at night. 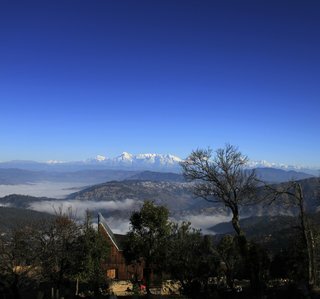 Views of the of the Northern Himalayan range in the distance. A variety of large square windows have also been carefully inserted on all sides of the insulated envelope to frame "zen views" of the landscape. 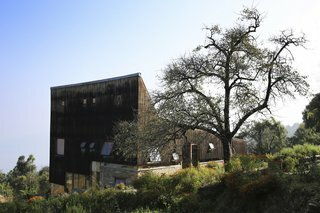 The exterior is cladded with tun timber, a wood that is native to the region. Pine paneling clads the interior. Peach, plum, and apricot trees grow in abundance around the home, as does an herb garden. The operable windows can be opened to let in cooling cross breezes. 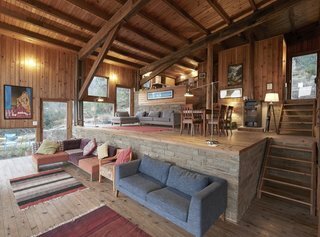 The Wood House sleeps up to 10 guests with five beds and five-and-a-half baths. Fortunately for us, Lokesh has opened his family’s holiday retreat to the public. 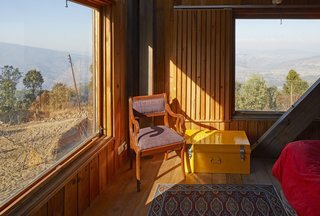 If you're interested in experiencing this Himalayan haven, book the Wood House here. The Wood House upper floor plan. 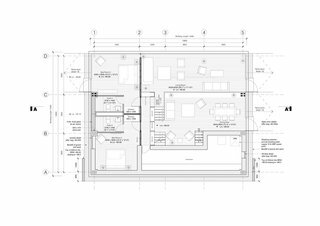 A look at the lower floor plan. Structural Engineer: Mithran Structures Pvt. Ltd.